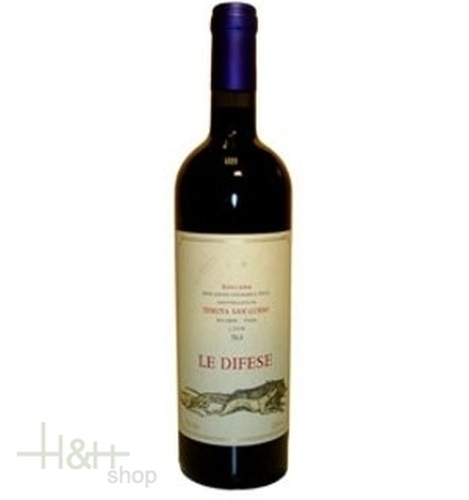 Le Difese is a blend of approximately 80% Sangiovese and 20% Cabernet Sauvingnon. The grapes are vinified in a new cellar created especially by the Tenuta San Guido in the locality known as 'Vecchio Frantoio" (Old Olive Press) not far the town of Bolgheri. The fermentation took place in stainless steel temperature controlled vats with a 14 days maceration period for Cabernet Sauvignon and 12 days for Sangiovese. The wine was then aged for 14 months in French and American oak barriques, one-third of these being new ones. The resulting wine is of an intense ruby red colour. On the nose, the fruits scent is obvious and quite complex. On the palate, the wine shows a very good structure, being at the same time accessible and pleasant. "Doctorwine" has rated the wine "Tenuta San Guido Le Difese Toscana IGT, Tuscany, Italy" from the vintage 2010 on 16.05.2013 with 85 of 100 points.
" This younger brother of the very famous Sassicaia is a lovely red, easy to drink and not too expensive, considering its pedigree. It is 70% Cabernet Sauvignon and 30% Sangiovese, a reminder that Bolgheri is always in Tuscany. The ruby color is bright and intense, while the aroma has nice scents of blueberry and blackberry and the flavor is delicate, agile, with a sober elegance that ends in a subtle yet long finish. A wine from white meats, great with chicken and peppers or rabbit with olives. " "Wine Spectator" has rated the wine "Tenuta San Guido Le Difese Toscana IGT, Tuscany, Italy" from the vintage 2014 on 31.07.2016 with 88 of 100 points. "Wine & Spirits Magazine" has rated the wine "Tenuta San Guido Le Difese Toscana IGT, Tuscany, Italy" from the vintage 2013 on 01.04.2016 with 91 of 100 points. "Wine Spectator" has rated the wine "Tenuta San Guido Le Difese Toscana IGT, Tuscany, Italy" from the vintage 2013 on 31.10.2015 with 89 of 100 points. "Vinous Antonio Galloni" has rated the wine "Tenuta San Guido Le Difese Toscana IGT, Tuscany, Italy" from the vintage 2013 on 01.10.2015 with 90 of 100 points. "Wine & Spirits Magazine" has rated the wine "Tenuta San Guido Le Difese Toscana IGT, Tuscany, Italy" from the vintage 2012 on 01.04.2015 with 88 of 100 points. "Wine Enthusiast" has rated the wine "Tenuta San Guido Le Difese Toscana IGT, Tuscany, Italy" from the vintage 2013 on 08.01.2015 with 91 of 100 points. "Wine Enthusiast" has rated the wine "Tenuta San Guido Le Difese Toscana IGT, Tuscany, Italy" from the vintage 2012 on 07.01.2015 with 87 of 100 points. "Vinous Antonio Galloni" has rated the wine "Tenuta San Guido Le Difese Toscana IGT, Tuscany, Italy" from the vintage 2012 on 01.12.2014 with 87 of 100 points. "Wine & Spirits Magazine" has rated the wine "Tenuta San Guido Le Difese Toscana IGT, Tuscany, Italy" from the vintage 2011 on 01.04.2014 with 90 of 100 points. "Wine Enthusiast" has rated the wine "Tenuta San Guido Le Difese Toscana IGT, Tuscany, Italy" from the vintage 2011 on 05.01.2014 with 90 of 100 points. "Wine Spectator" has rated the wine "Tenuta San Guido Le Difese Toscana IGT, Tuscany, Italy" from the vintage 2011 on 31.10.2013 with 89 of 100 points. "Vinous Antonio Galloni" has rated the wine "Tenuta San Guido Le Difese Toscana IGT, Tuscany, Italy" from the vintage 2010 on 01.09.2012 with 89 of 100 points. "Wine Enthusiast" has rated the wine "Tenuta San Guido Le Difese Toscana IGT, Tuscany, Italy" from the vintage 2009 on 02.01.2012 with 90 of 100 points. "Vinous Antonio Galloni" has rated the wine "Tenuta San Guido Le Difese Toscana IGT, Tuscany, Italy" from the vintage 2009 on 01.08.2011 with 90 of 100 points. "Wine Spectator" has rated the wine "Tenuta San Guido Le Difese Toscana IGT, Tuscany, Italy" from the vintage 2008 on 30.09.2010 with 88 of 100 points. "Vinous Antonio Galloni" has rated the wine "Tenuta San Guido Le Difese Toscana IGT, Tuscany, Italy" from the vintage 2008 on 01.09.2010 with 89 of 100 points. "Wine Spectator" has rated the wine "Tenuta San Guido Le Difese Toscana IGT, Tuscany, Italy" from the vintage 2007 on 31.10.2009 with 90 of 100 points. "Wine Spectator" has rated the wine "Tenuta San Guido Le Difese Toscana IGT, Tuscany, Italy" from the vintage 2006 on 30.09.2008 with 90 of 100 points.